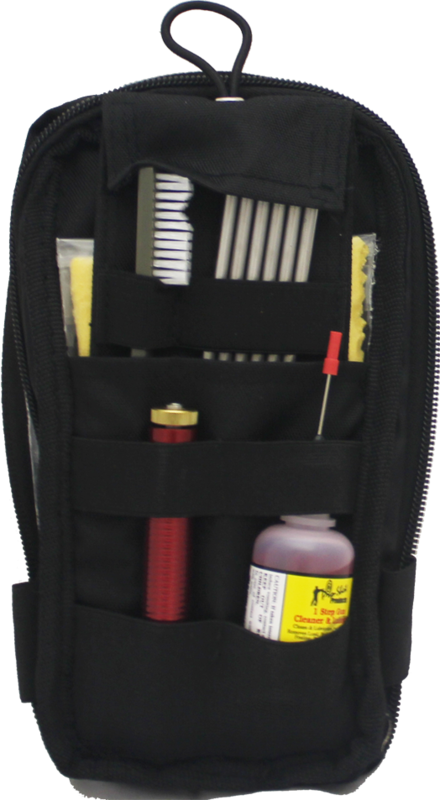 Pro-Shot Universal Tactical Cleaning Kit in Molle Pouch. Tactical Universal Molle Cleaning Kit TACTICAL POUCH, 6 QTY. ROD SECTIONS WITH A 39" COMBINED WORKING LENGTH, RED SWIVEL ALUMINUM HANDLE DOUBLE END NYLON UTILITY BRUSH 7 QTY. BORE BRUSHES (#22P, 22R, 30R, 9P, lOP, 45P, & 125), SHOTGUN ADAPTOR, SHOTGUN PATCH HOLDER, .22-.45CAL PATCH HOLDER, 1 STEP NEEDLE OILER, 3 SIZES OF CLEANING PATCHES, PRO GOLD LUBRICANT, AND SILICONE CLOTH.